Men were enraptured by the swashbuckling life long before Pirates of the Caribbean came along, though it was that ride that clearly started the trend towards hiring dogs to work as jailers. 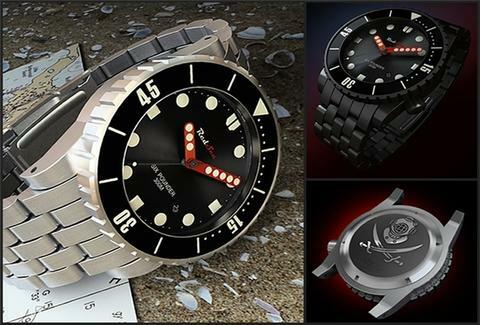 Allowing you to pillage the depths of the Cardiff-by-the sea in modern-pirate style, Red Sea Watches. From a couple of landlubbers obsessed with pirates and their tools of the trade, RSW's now decking wrists with high-quality, traditional dive-style, limited-edition (75 per piece) time keepers, because even sea marauders need to be on time... for ransom drops!! They're releasing two similarly styled numbers: the Holystone, named for the soft sandstone once used to scrub the decks, and the Six Pounder (a low-caliber naval cannon), both with stainless steel cases, which'll handle the pressure of up to 164 fathoms (or 300m), luminescent blue accents on their hands and faces, and a 120-click timing bezel, which is much more approachable than the mean & petty 120-clique version. Each piece comes with a trifecta of bands (rubber, uber-durable nylon, and stainless steel 5-link) while the strappy beasts are available in stainless steel and slightly more expensive jet black, applied using Physical Vapor Deposition (PVD), whose airy testimony surprisingly doesn't result in a thinner case. Each watch's underbelly is engraved with classically crossed sabers below an old-school diving helmet straight out of BioShock, which most detention center's employees suffered from, when they read the resumes of the canines replacing them.